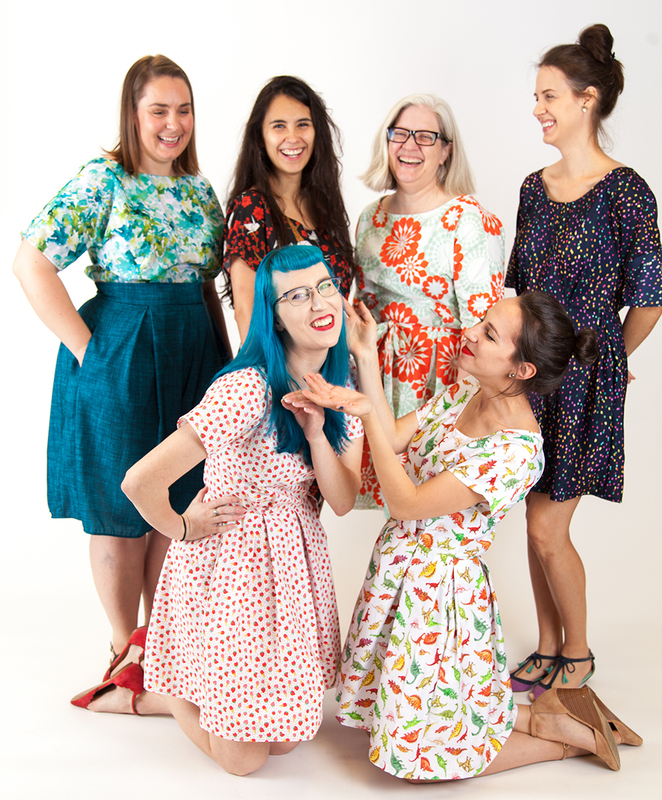 This year, 10 eager Spoonflower team members challenged themselves to make the same dress, the Zeena from By Hand London and available through Sprout Patterns, for Me-Made-May and today they’re sharing what their experiences were like. By the time you’re done reading, you’ll be ready to make your own version following the tips and tricks these Zeena Warrior Princesses learned along the way. What fabric did you choose? Holly: I chose Organic Cotton Sateen Ultra because it has a luxurious feel and a bright polished look. I would also love to try this dress in Organic Sweet Pea Gauze! 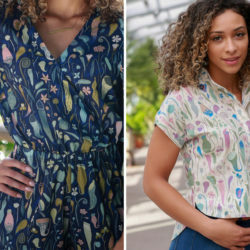 Nicole: I have never sewn with Chiffon, so this seemed like a great opportunity to combine an easier dress pattern with a more difficult fabric. Paula: I wanted a breezy cotton for the upcoming summer so I chose Kona® Cotton Ultra. The thicker weight of the fabric gives the box pleats a nice structure. What design did you choose? 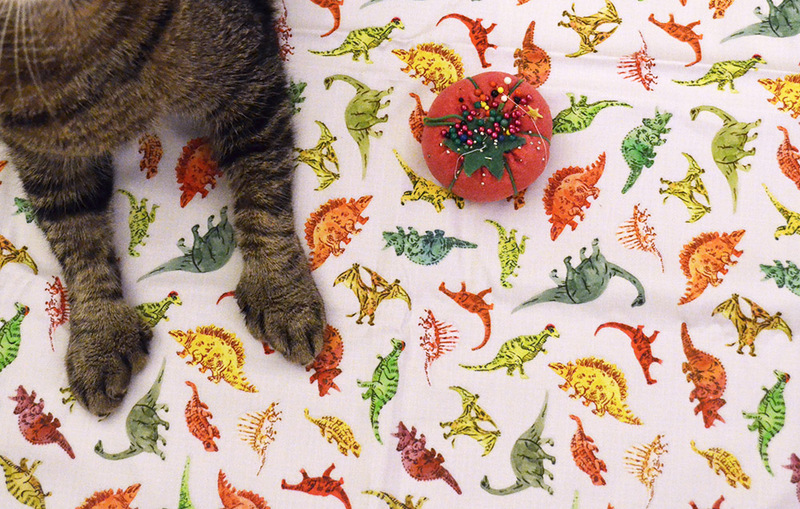 Gina: I chose Dinosaur Party by imaginaryanimal. I am known around the office as a dinosaur lover and honestly growing up to be like Ms. Frizzle has always been a goal of mine, so this design seemed like a great fit. MaryAshlyn: I chose Paradise Bloom Dark by crystal_walen. There are so many amazing designers who sell in our Marketplace, but her shop is definitely one of my favorites. I love her take on florals, and the moody tones in this design are gorgeous! Andrea: Origami Crane by jacquelynbizzottodesign. I was fascinated by the recent origami design challenge and when I found this design, I fell in love immediately. My husband helped me pick it out and I am very pleased with how it turned out. Amy: I chose this retro flower pattern by suziedesign. It’s been in my favorites for a while now waiting for the perfect project, and I realized that the big bold flower pattern was a perfect match for Zeena’s retro silhouette, not to mention for the start of what looks like a hot summer. See what other designs we chose in our Me-Made collection! What Zeena version did you make? 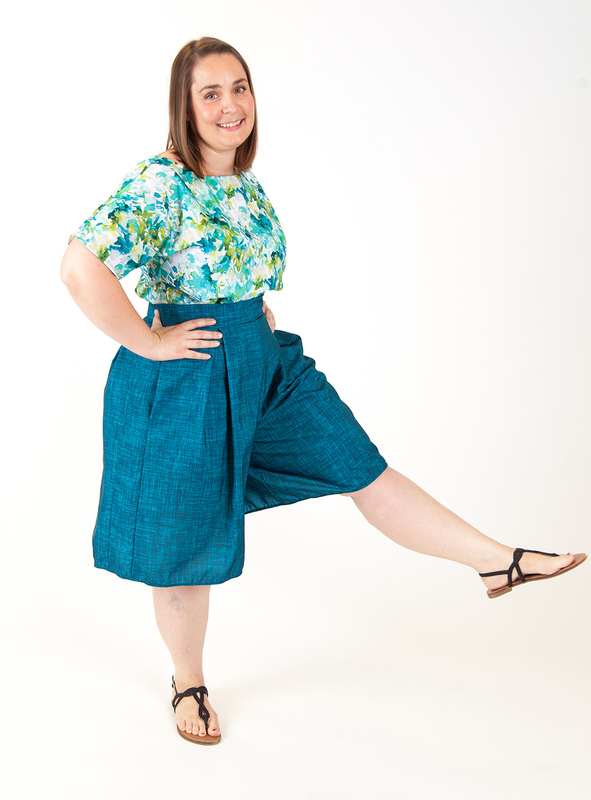 Holly: I chose to make my Zeena with short sleeves and a scoop neck, and with the longer skirt. Short sleeves because it’s pretty much summertime, longer skirt for modesty. It’s so great to have a longer-skirt option, although I would have lengthened it myself if I had needed to. Paula: I chose the short version with short sleeves. I tend to like my skirts/dresses to hit mid-thigh length. Amy: I chose the long version. I love the way the elbow-length sleeve looks, and I like having enough extra fabric to be able to adjust the skirt length to somewhere between the two variations — and have a little extra fabric to play with! 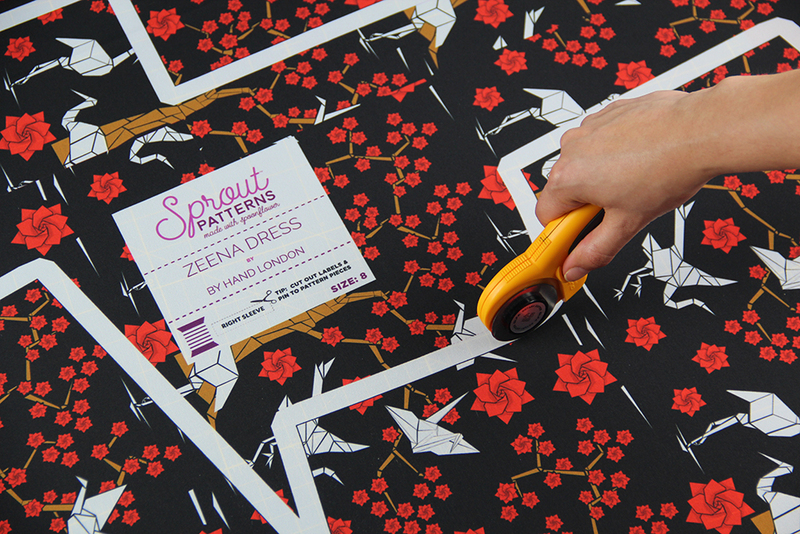 Did you use Sprout Patterns for your Zeena? Gina: I did Sprout! I have two cats who love to help me sew and a small apartment with no good place to lay out a pattern except the floor. Anytime I do need to lay out a pattern, there’s a good chance it’ll end up with tiny claw holes in it from where I have to forcibly remove my polydactyl cat, Oz, from the fabric I’m trying to cut. He may or may not have lost whiskers this way at one point. Sprout is a lifesaver. Paula: Yes! I can’t stand taping together PDF patterns (and I don’t have access to a print shop). I was also in a big time crunch to get this project made. Using Sprout meant that I could cut it out and sew it up in a day! 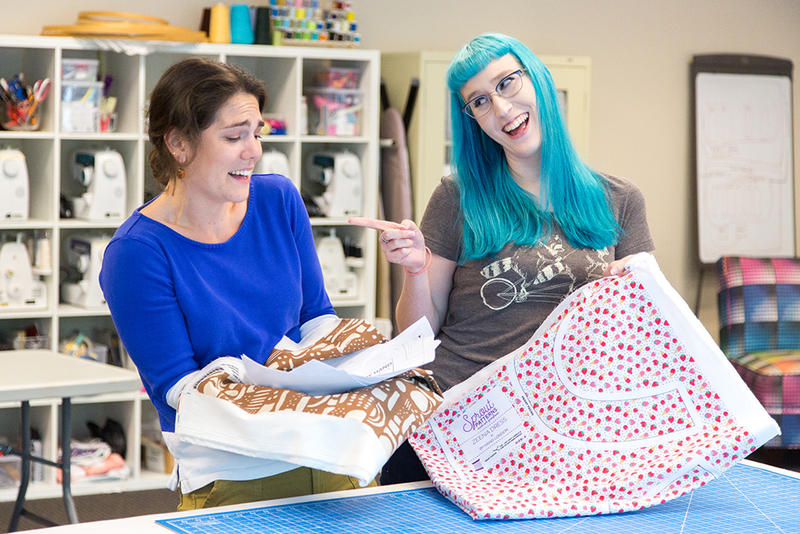 Meredith preps for a weekend of taping together her PDF pattern while Paula enjoys the ease of using a Sprout Pattern project. Andrea: Yes! I have a small family and a full time job that keeps me busy most of the time. I used Sprout because it saves me time… a lot of time. This way I make sure my time is spent wisely actually sewing and creating. Six of the 10 Zeen’sters opted to use Sprout Patterns and by the looks of it, we’d say they’re pretty pleased with the results! Did you make any modifications from the existing pattern? Holly: I fully lined the bodice using the same fabric as the whole dress. I did this for two reasons: modesty and because I hate neck facings. A lining just makes a garment that much easier to wear without having to worry about what to wear under it. Neck facings also seem so flimsy and I don’t like how you can often see them through the dress. Also, I love to know that my me-made garment is just as pretty on the inside as the outside. Looking back, I probably should have chosen a plain white fabric lining, because you can see a bit of the lining fabric pattern through to the outside of the dress, but it doesn’t bother me. Beckie: The most major adjustment is that I transformed the skirt into culottes and made a jumpsuit instead of a dress! I used the Winslow Culottes pattern by Helen’s Closet. I’ve already made several pairs and was familiar with the fit and the skirt pattern on the Zeena is just rectangles that get pleated. My main question was whether the existing panels would be wide enough for the Winslow Culotte pieces. 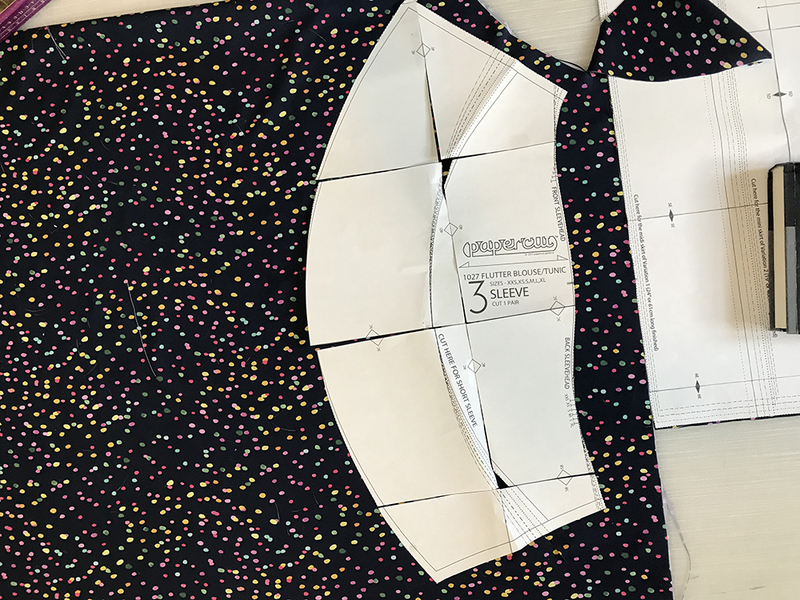 I laid the Winslow pattern pieces on the Zeena Sprout project and found that I had enough fabric to cut the culotte fronts out of the skirt front but the back culotte pieces were slightly too wide. I needed another 2.75” to make it work. Luckily, the extra printed area outside the printed pattern was wide enough to accomodate! I cut two strips from the lengthwise grain to add to my back panels and one strip along the cross grain to make a waistband. I discovered while making my muslin that I needed more length in the torso to make the jumpsuit work. The waistband was cut as wide as possible from the extra fabric in the same length as the bottom of the bodice. I marked the bodice pleats and side seams on the waistband and then matched the culotte side seams. I adjusted the culotte box pleats to align with the bodice pleats and use up the available width to match the waistband. I ended up using a 30” invisible zipper because I needed the extra length to open up the waist/hip space when dressing. Otherwise I was trying to squeeze my 52” hips through my 35” waistband! My other alteration was to sew the sleeve seams with a more narrow seam allowance (⅜”) and add a gusset/wedge to the underarm. This gave me the extra width I needed for my biceps and some increased range of motion. 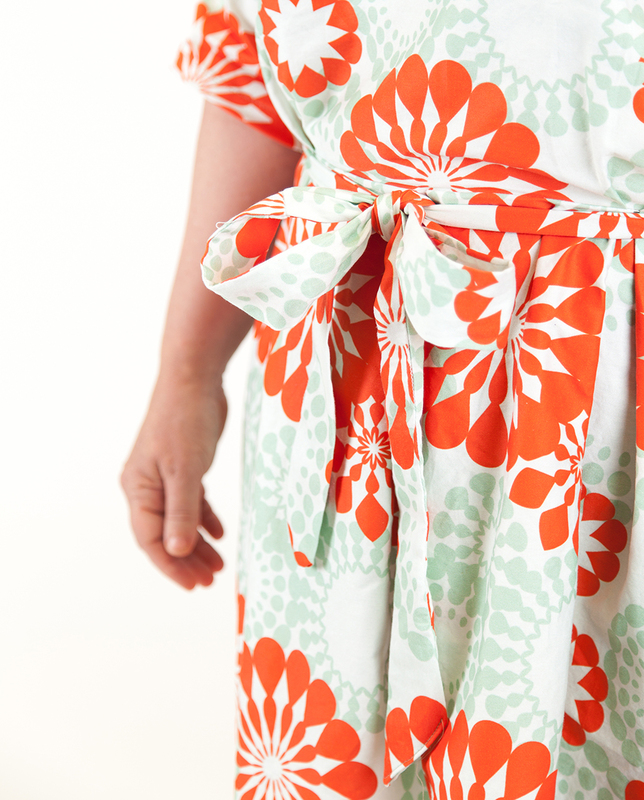 Nicole: I shortened the sleeves by 2-3″, gathered the skirt instead of pleating, and added a ruffle to the skirt hem. I also finished the neckline with bias binding instead of using facings and used french seams everywhere I could because the dress is sheer. Meredith: One challenge I set for myself this month was to focus on making things other than dresses! 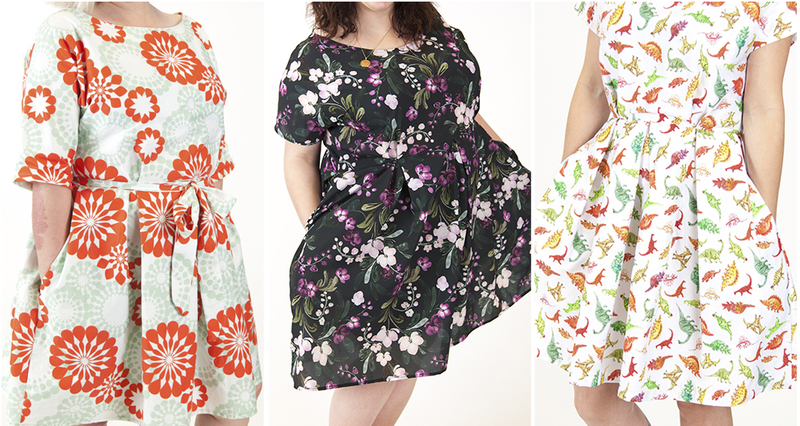 I’ve got so many dresses (I’m referred to as the Kielo Queen in the office thanks to the 5 Kielo Wrap Dresses I’ve made!) and have decided to work towards adding more handmade shirts into my closet. Inspired by a former teammate, I shortened Version 2 of the Zeena to make a peplum and I couldn’t be happier with the results! 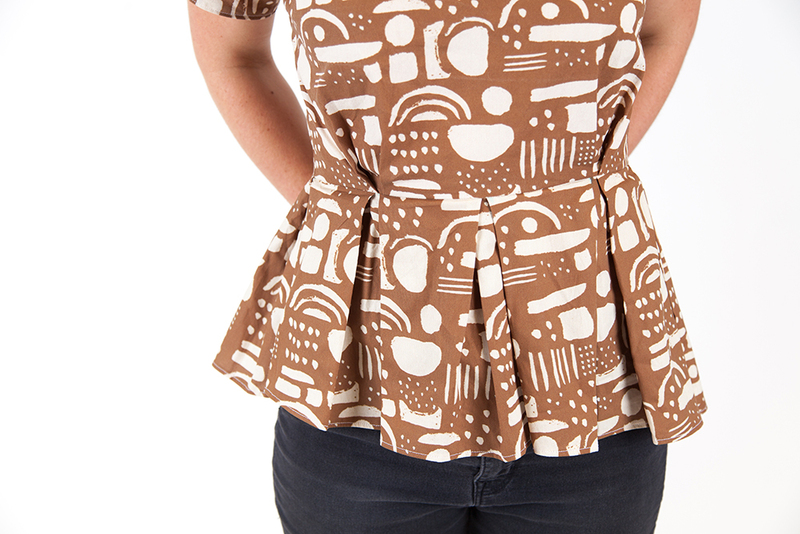 Meredith modified her Zeena to make a peplum top featuring Blobby Shapes by francesandtheo. 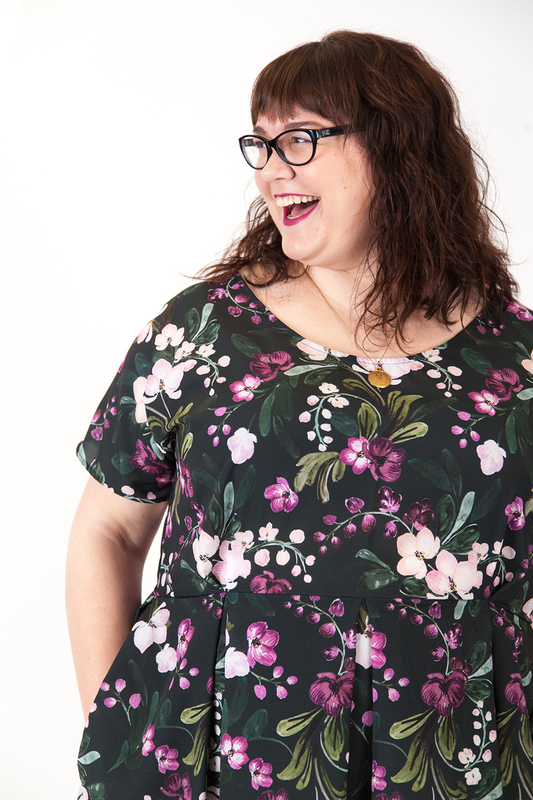 Suz: I wanted to lengthen the sleeves for a more elegant look, and was able to order a Silky Faille fat quarter of the same design at Spoonflower to go with my Sprout project. 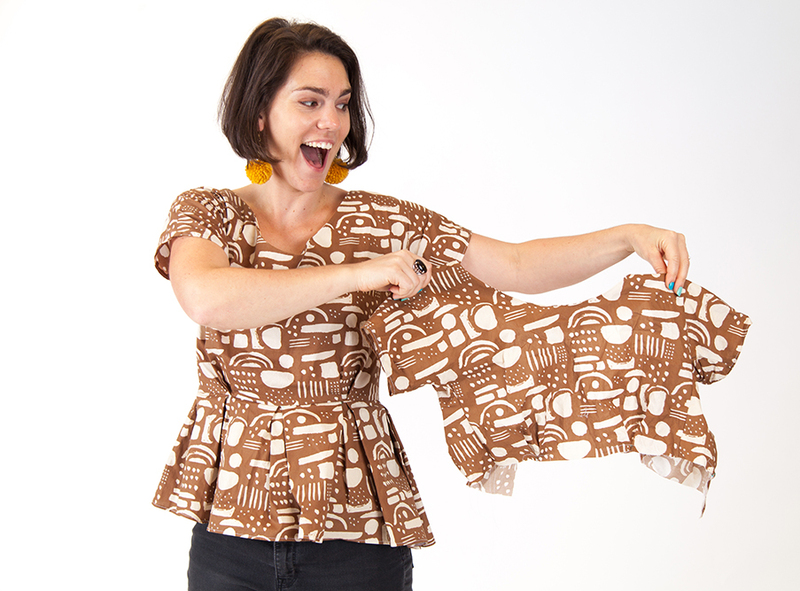 I had previously made the Papercut Patterns’ Flutter Tunic through Sprout Patterns and loved the sleeves on those, so I used the printed paper pattern of the Flutter Tunic (a bonus you get when ordering through Sprout) to create a flutter sleeve. After I stitched the shoulder seams on the Zeena, I opened the sleeve to determine the full length of the armhole opening for the extension. On the fat quarter, I measured 2” away from the edge of that line on either side and 4.5” down, then cut the angles off the side. Then I used my Flutter sleeve pattern piece to create the curvature. I attached this additional fabric on like you would a cuff, matching right sides up, and then flipping it down. When I sewed the side seams together, I simply sewed all the way up through the end of the added flutter, and then hemmed the edges. To me, this added some drama to the shorter sleeve version. What was the hardest part about making the Zeena? Gina: I was a little challenged by pinning the pleats on the skirt. The instructions don’t make it super clear that there are pleats on the sides and back, and because I used the Sprout Pattern I misinterpreted those markings initially. 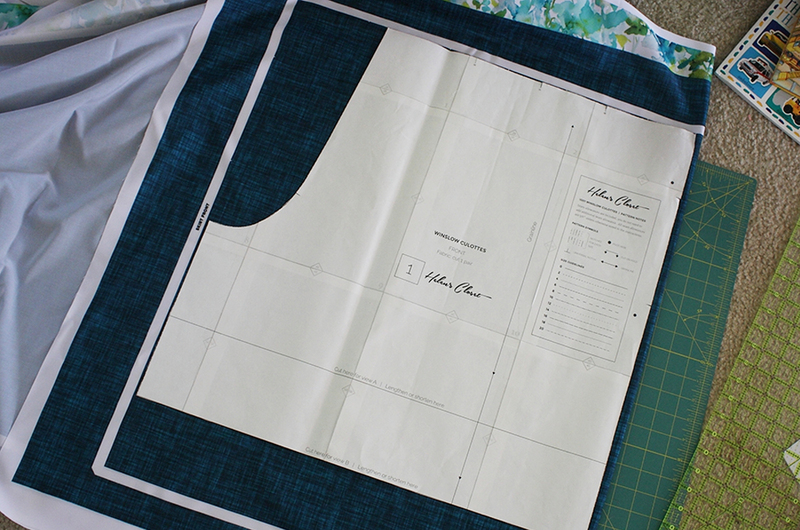 However, once I opened the pdf pattern it became clear and the pleats turned out just fine. Amy: I totally missed that one of the pleats on each side lies directly over the side seam, with a fold coming from front and one from the back, so I spent a while staring at several extra inches of fabric and a notch that didn’t seem to match up with anything until I figured it out. What is your favorite part about the Zeena? Andrea: My favorite part about the Zeena are the pleats! Even though it took me a long time to get them to sit perfectly, it was totally worth it. Amy: Two words: box pleats. They might say diamonds are a girl’s best friend, but we think it’s actually pockets in a dress. What advice would you give to future Zeen’sters? Holly: Think about your particular body and what modifications you might make to ensure the dress will be what you want. 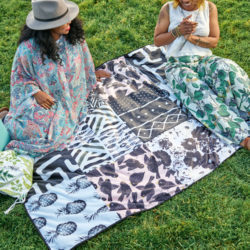 Then, as with any sewing project: make sure you read through the directions before starting, make sure your pattern pieces print out correctly, and just take your time! 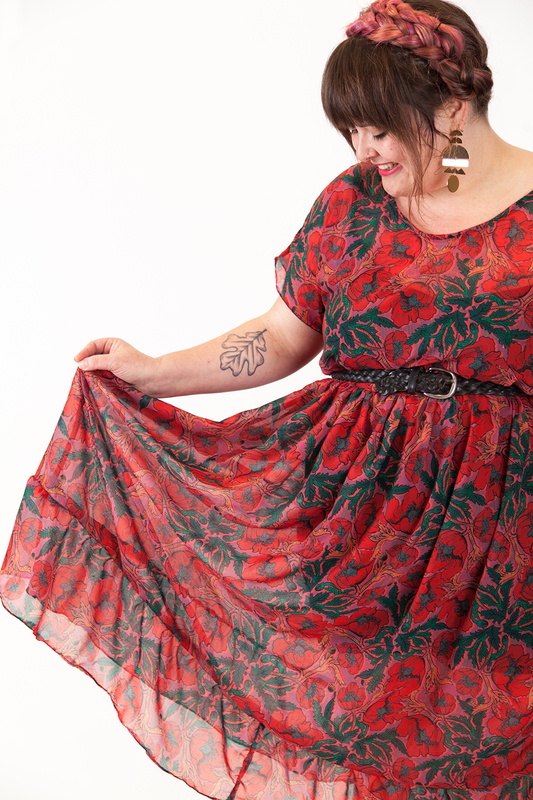 Nicole: The Zeena is a great dress to help you get out of your comfort zone! It’s on the easier side (no setting in sleeves, pleats instead of darts), and has a lot of room for customization. I would start with the original silhouette and add hacks depending on your mood. Meredith: You know the phrase, “Measure twice, cut once”? Well, my biggest advice would be to follow that rule for the Zeena and ALL sewing projects! Like Suz, I also ran into a printing issue and didn’t measure the 4” test square before starting. While pressing the sleeves I started to question how I was going to get my arms through and sure enough… I couldn’t. After a bit of digging through the trash to find the pattern, I remeasured the test square only to find out it was 3.5”. Don’t let the smile fool you! After realizing her PDF pattern had printed too small, Meredith had to remake her bodice. What does Me-Made-May mean to you? Andrea: I see Me-Made-May as a way to celebrate the garments I have taken the time to make myself. There is so much love and time put into each piece I make, it is nice to see them getting used and not just sitting in the closet for ages. I see Me-Made-May as a way to evaluate what me-mades I wear and the ones I don’t. It challenges me to think about my evolving style and sewing habits and how I can improve these. Suz: Me-Made-May is both inspiring and challenging—it helps me realize how far I have to go to get to a more handmade, sustainable wardrobe. I love getting ideas from others on Instagram who participate in the challenge daily. You have to start somewhere! Nicole: There are over 27k posts under the #mmmay18 hashtag on Instagram and the month isn’t even over — no matter if you participate every day or part time, post about it online or not, Me-Made-May showcases the amazing, inclusive community of makers across the world. It is so inspiring to see what people have created for themselves, then seeing them rock those outfits in their day to day life. While sewing is something I typically do alone, Me-Made-May connects me to a creative community around the world for one month each year. 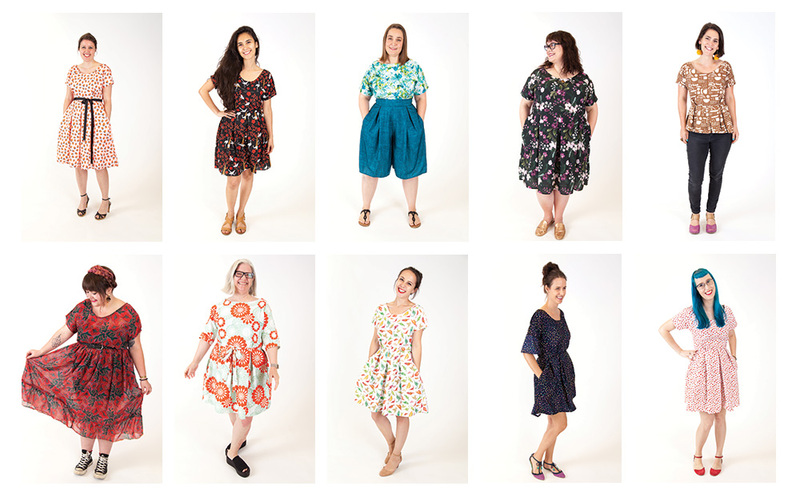 When May ends, I feel inspired and energized by everyone’s me made wardrobes that it makes me love sewing even more. Will you join us next Me-Made-May? If you’re ready to make your own Zeena to join our party, get a head start with these party-approved designs from the Marketplace! They all look great! One question – one of you mentioned the idea of doing zeena in gauze, which sounds great, but I think is not available because it was not an available substrate when the pattern was released. Is there any way to update the options of fabrics or order on other substrates? Due to the properties of gauze and the nature of the fabric after washing, it’s unfortunately not a good fit for Sprout Pattern’s method of printed sewing pattern lines on the fabric. 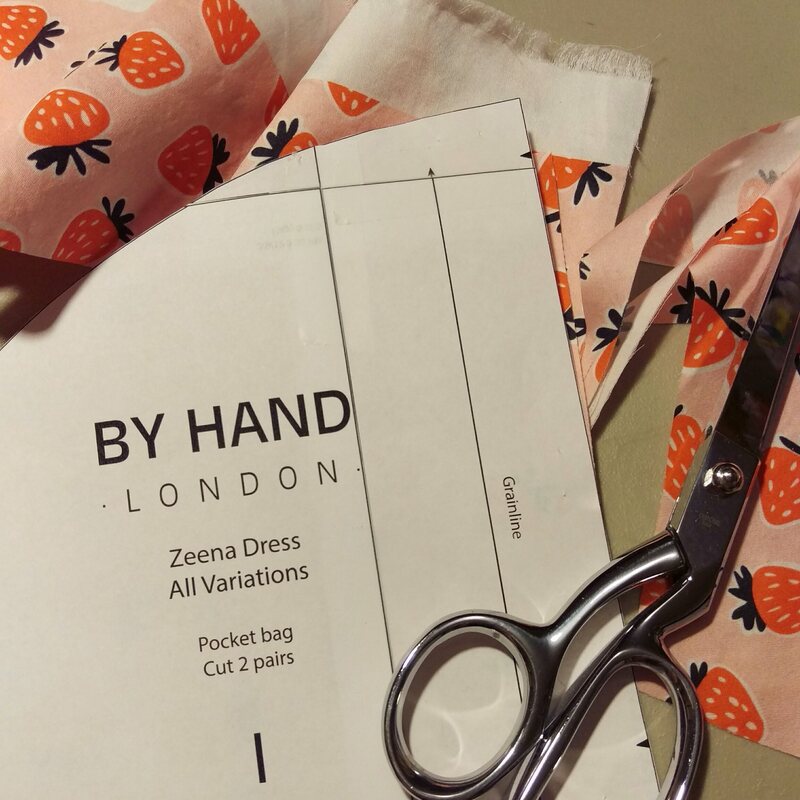 We suggest pre-washing gauze before tracing and cutting the pattern out, so you could use the digital paper pattern from By Hand London and order yardage of gauze through Spoonflower if you’d like to give it a try! 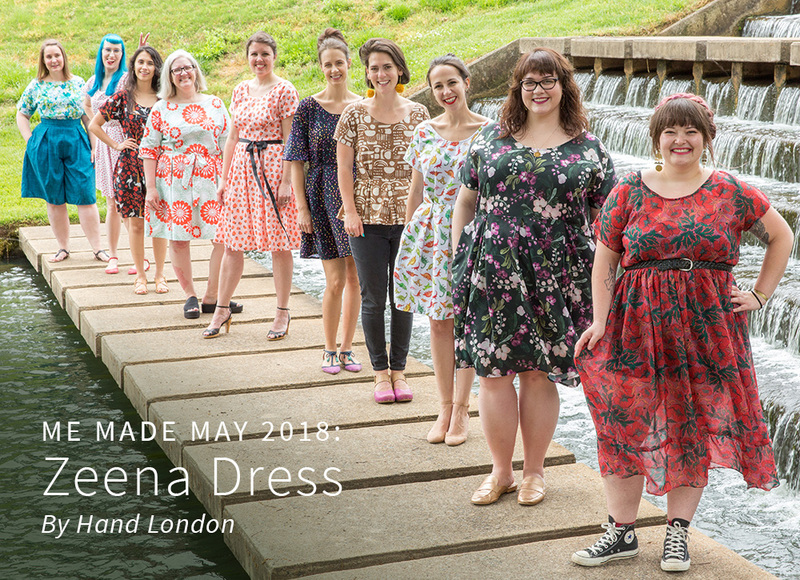 I am sooooo happy that not everyone you featured on this Made by May is a size 10! While reading this post, my tummy tingled…I wanted to get started right away on making my own dress! Working with fabric and making clothes for myself have been on my mind lately. I haven’t made clothes before but seeing all the wonderful versions of the Zeena dress is very inspiring. The insight and comments from the makers is definitely helpful! We’re so glad you enjoyed our Me Made May feature! We’ve updated the second group photo to list the specific fabric base each team member used! You can learn more about all of our fabrics here.